The government Wednesday decided to make the Pradhan Mantri Jan Dhan Yojana (PMJDY) an open-ended scheme and added more incentives to encourage people to open bank accounts. The flagship financial inclusion scheme was launched in August 2014 for a period of four years. In view of the "runaway success" of the scheme, now it has been decided to make it open-ended with more incentives, Finance Minister Arun Jaitley told reporters after the Union Cabinet meeting. Jaitley -- who was briefing the media for the first time since resuming office on August 23 after a four-month break for undergoing a kidney transplant -- said the over-draft limit for account holders has now been doubled to Rs 10,000. 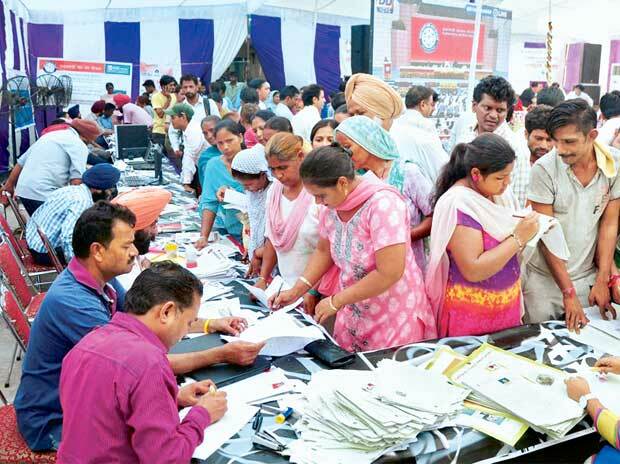 The free accident insurance cover for those opening Jan Dhan accounts after August 28 too has been doubled to Rs 2 lakh. There will be no conditions attached for over-draft of up to Rs 2,000. Also, the upper age limit for availing the facility has been hiked to 65 from the earlier 60 years. There are approximately 32.41 crore Jan Dhan accounts having a total deposit balance of Rs 81,200 crore. About 30 lakh people have so far availed the over-draft facility. "It has been decided to continue the flagship financial inclusion programme PMJDY with focus on opening account from every household to every adult," the minister said. The pipeline of Jandhan-Aadhaar-Mobile (JAM) will continue to provide the necessary backbone for coverage of these activities and thereby accelerating the pace of digitised financially included and insured society, an official release said. Launched in August 2014, the first phase of the PMJDY scheme was focused on opening basic bank accounts and RuPay debit card with inbuilt accident insurance cover of Rs 1 lakh. Phase II beginning August 15, 2015 was planned to provide micro-insurance to the people and pension schemes to unorganised sector workers through Business Correspondents. This phase ended last month. Jaitley said 53 per cent of the PMJDY account holders are women, while 83 per cent of the total accounts are seeded with Aadhaar.